5. You can't go wrong with pretty pink nails especially in spring. Essie "Status Symbol"
omg fabulous list taylor!! 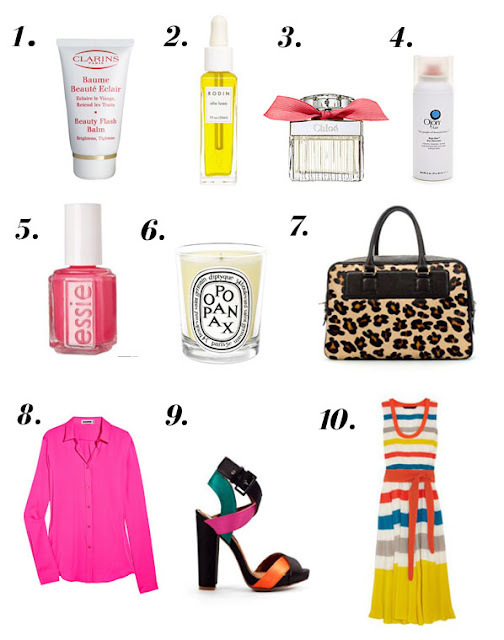 I must check out that face oil, it sounds amazing and have you seen this UO dress similar to marc one? I ordered one and I can't to receive it! I can go for those shoes and that dress.. One of each in my size please!! the top, shoes and dress are so pretty and bright. i might want to add them to my wish list for spring/summer too although it's already filling up. That's the dress that Michelle Obama wore to South America. Good pick. That was my favorite of all the dresses she wore. OH I love the Ojon Dry Shampoo! I have dark hair now and it even works in it with out leaving a "powdered look". Great picks. I love the Jill Sander blouse, but not the price tag. I'll definitely be on the lookout for a cheaper, just as fab version. That fuschia blouse is incredible great picks! Love this list, great to do this at the beginning of every season! Lovely collage...I love that M by MJ striped dress! i have been eyeing that jil sander blouse and actually have it set to go in an upcoming post-it is perfect! I love all your picks! Now you're giving me the shopping itch! I have been wanting to try that Rodio oil forever- I have heard so many amazing things about it. Taylor I've had my eye on those Zara heels (as well as a few other heels there right now)!! Great spring list! I've been dying to try that Olio Lusso face oil, too! Erin, ha that's too funny about #4--I love the smell. I guess everyone is different. :) I need #2 and #9!! Man I need a trip to Zara! Alicia let's go! I completely agree with #10! I can't wait for the sun to come out and get to Santa Cruz for some tanning (with SPF of course). I am in desperate need of that Cali sunkissed glow. The Marc Jacobs dress is on my list too. Has been since the first time I saw it and made the mistake of trying it on. This reminds me that I have yet to check out Marc Jacobs' spring line. That dress is adorable! That Essie shade is GORGEOUS! The perfect pink for spring. And I love the colorful Marc Jacobs dress. Love a punch of color! The jill sander blouse is fab! I love this wishlist! The bright punchy colors for spring are so fun and fresh--and you look gorgeous in them too! I am so down with that bowler! ASOS has a similar one I featured on Frugal Friday. Heavily obsessing over that Marc Jacobs goodness right along with you.. desperately wanting to find a designer look a like! Now that Essie is carried in local drug stores, I've had to refrain from buying nearly every time I walk into a Target, CVS, or Walgreens..eeek! ive had my eye on everything jil sander - i need to give it a rest!!! I can't live without my Ojon dry shampoo... love it. Great picks! I want them all too! I love the Marc jacobs dress. I love those Zara sandals and have been OBSESSED with the marc by marc dress since I saw it in ads. It's so expensive:( Let me know if you see any look-a-likes. I haven't found the perfect one yet.